This is it! The moment you have been waiting for… The number one requested feature from several Codefresh customers is now in production. You can finally run parallel steps within Codefresh pipelines. Notice the type:parallel segment in the pipeline. Unlike other solutions which allow you to use parallelism only in a specific pipeline segment, in Codefresh you can create parallelism with ANY type of step in a pipeline. Do you want parallel quality scanning? You have it. Interested in parallel deployments? You can do it. Linting while load testing? Anything is possible. The pipeline is running both integration/load testing in parallel and then deploys to two environments at the same time. The basic parallel mode will cover most of the typical parallelism scenarios in Codefresh pipelines. We realized, however, that several organizations might want more flexibility on the types of parallelism needed in CI/CD pipelines. This syntax makes the pipeline use the full parallel mode. In this mode, the order of build steps in the codefresh.yml no longer matters. Instead, each step will be executed according to its dependencies. You have to specify the full order of steps using conditionals. In this example, we specify the step named “second_step” will only execute after “first_step” is finished. 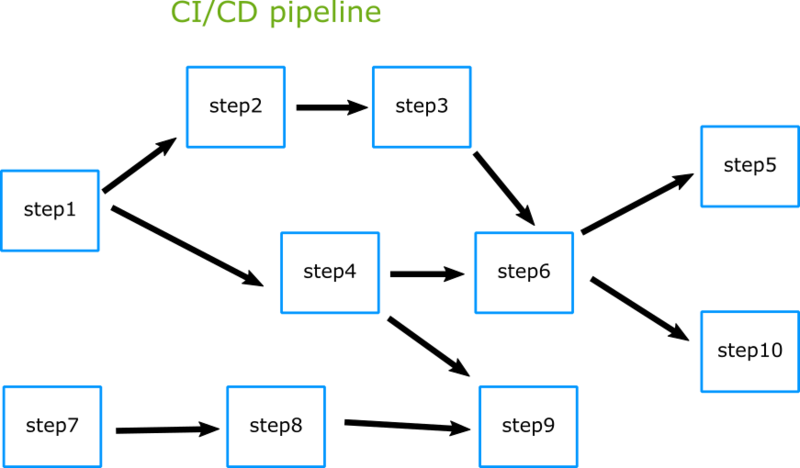 The example CI/CD pipeline only uses dummy freestyle steps, so feel free to use it as a starting point with your own steps. The advanced parallel mode described in the previous section is very powerful and we believe that it can cover a wide range of parallel scenarios for pipelines. But we still decided to take it to the next level by giving you the full power of pipeline graphs. You can have as many “starting” steps as you want and as many “ending” steps. Your pipeline does not need to start and end in a single step. The possibilities are endless. The parallel mode has even more features not mentioned in this blog post. See the full documentation page for more details.